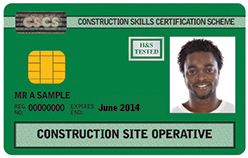 The green Construction Site Operative (CSO) card was withdrawn on 1st July 2014. There is a new Green Labourer card for people working in labouring occupations. CSCS is urging card holders (and their employers) to make the necessary arrangements to replace the CSO card before they expire. CSO card holders who do not take the necessary steps to replace their card will find they will be unable to obtain another CSCS card. This could prevent you from working as the majority of employers require a valid CSCS card to get on site. The withdrawal of the CSO marks a major step towards achieving a fully trained and qualified workforce.